Politics has always exploited the pop culture to reach "the people," but in our identity-conscious time when social media is employed as the mode of communicating, pop references can be hazardous to the health of your political party. Those using such new ways of talking must know the audience, like a traveling salesman must "know the territory." When Rep. Ilan Omar of Minnesota set out to offend and insult the Jews, she drew on a pop vocabulary familiar to her and millennials like her, ripe with the language of rage and rap. She understood that the broader audience needed a little help. "It's all about the Benjamins," she said, referring to the hundred-dollar bill adorned with the image of Benjamin Franklin. 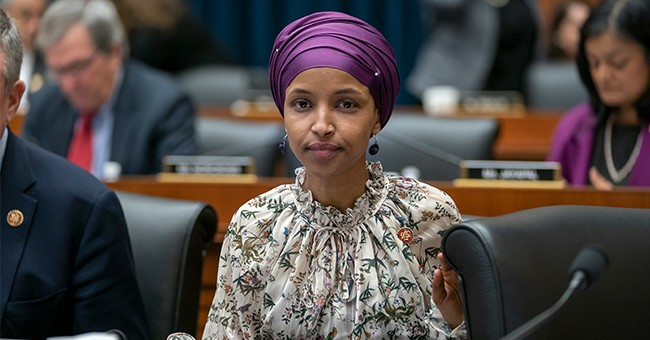 Senior Democrats said they were satisfied that Omar and her like-minded folk meant no offense, but to everyone else this was clearly a Jew-baiting slur suggesting that American support for Israel is about big-money donors and lobbyists rather than grassroots support for a democracy surrounded by hostile nations boasting they are determined to "wipe it off the map." The song "It's All About the Benjamins" was produced by popular rapper Puff Daddy in 1997. It soared to the top of the charts and was covered by various rival artists. It's rap sung raw, black rhythms and slant rhymes carrying eclectic and perverse images of "gold diggers" and "gold zippers." It's something of a black rap version of "Money," sung in the movie "Cabaret," which was set in the Berlin of the 1930s and meant to satirize the anti-Semitism of the Nazis. A line that was sometimes edited out of versions of the Puff Daddy song was a stereotypical slur celebrating greed of Jewish moneymakers: "You should do what we do, stack chips like the Hebrews." Uh-huh. It's not clear that the line was edited out of the song to avoid offending Jews, but when it was written, it was certainly meant to draw on stereotypical images of Jews and money. No one has to know a Jew to use the stereotype. It's not likely that Shakespeare had ever met a Jew when he wrote "The Merchant of Venice" and of his "pound of flesh," since Jews were expelled from England in 1290 and absent from the isles until Oliver Cromwell welcomed them home 366 years later. But the Bard knew how to particularize the common caricature of the venal Jew, and draw audiences of high and low breeding to watch the merchant squirm over the pound of flesh. Omar is certainly no poet, but she knows how to get attention from reporters, politicians and other opinionators debating anti-Semitism circa 2019. So vivid were the Muslim congresswoman's words, drawing on rap, that she even got the millennial media using half-forgotten literary terms such as "trope" and "metaphor," which many had not spoken since high school. Is she an anti-Semite? That's not the right question. She knows her audience: the BDS (boycott, divestment and sanctions) movement, the anti-Israel mob among millennials and their tutors on college campuses. She knows how to get attention, using the clicks of power by starting a debate over the meaning of a Jew-baiting tweet. Unless she has miscalculated, which only the fullness of time will reveal, she will keep her seat on the House Foreign Affairs Committee. The Democratic leadership is terrified of angering her and her followers. The older establishment Democrats could usefully revisit the regrets of the Sulzbergers, the Jewish family that then -- as now -- owned The New York Times during World War II, and was ashamed after the war for having downplayed stories of atrocities against European Jews in the run-up to the war, lest The Times be identified as "a Jewish paper." The Democrats may come to regret their cowardice in treating anti-Semitism as just another ism, which is what they did with their House resolution where Jews were squeezed into a long list of groups that found themselves maligned by prejudice -- African-Americans, Latinos, Native Americans, Muslims, Hindus, Sikhs, the LGBTQ community, immigrants, Asian-Americans, Pacific Islanders and others. Was the omission of Hottentots, vegetarians and Whirling Dervishes, nice folk all, a deliberate affront? In the Olympics of victimization, Jews no longer win the gold. As Rep. James Clyburn, the majority whip in the House and friend and supporter of Nation of Islam Louis Farrakhan, put it, in the new Democratic mindset, only Republicans, who are generations away from the Holocaust, are bad: Ilhan Omar, who spent four years in a refugee camp in Kenya after fleeing Somalia, suffered "more personal" pain than those whose parents are Holocaust survivors. That kind of analysis and emphasis, writes Lee Smith in Tablet Magazine online, is how American Jews have begun to pay the price of the Democratic Party's new political math. It's painting history by the numbers, and reducing tragedy to farce. "Never again" becomes "just one more time."